The three mobile network operators, who signed an NFC cooperation agreement in July 2010, are to begin testing a number of cross-border NFC services this month with the aim of launching commercial services by the end of 2011. RACE: The trial was announced as rival operators NTT Docomo and KT revealed plans to offer their own cross-border NFC services from the end of 2012. Korean mobile network operator SK Telecom and its Japanese NFC partners KDDI and Softbank Mobile have announced they are to begin internal testing of cross-border NFC services this month. Mobile payments. In Japan, the operators are working with MasterCard, Credit Saison and Orient Corporation on mobile versions of MasterCard’s contactless PayPass service. In Korea, an NFC version of the widely used prepaid T-Cash service is being tested. Users will equip their mobile phones with a special SIM card stored on a dongle and use it to pay for goods and for public transportation fares. The T-Cash application also allows users to check their mobile money balance and recharge it with funds from their credit card or via their phone bill. Smart posters. Posters equipped with NFC-compatible RFID tags will be placed in some 110 locations in Tokyo and 150 locations in Seoul. 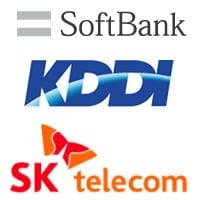 KDDI and Softbank Mobile first signed a deal with SK Telecom in July 2010 with the aim of working together to switch from their existing non-NFC standard mobile contactless services to an NFC standard approach. KDDI is conducting extensive NFC tests with partners including Toyota, All Nippon Airways (ANA), Japan Airlines (JAL), Toho Cinemas and card issuers Orient Corporation, Credit Saison, and Aiwai Card Services. This week, rival Japanese and Korean operators NTT Docomo and KT also announced plans to offer compatible cross-border NFC services although a commercial launch looks set to take place a year later, at around the end of 2012. “The company also aims to further promote mutual cooperation on expansion of NFC payment services with partners in Europe or the United States, creating the early stages of what soon could become a unified global mobile payment service environment,” Korea IT Times adds.